Serve someone with a generous serving of simply delicious gourmet sausage and cheese. 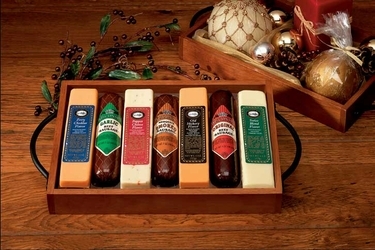 Includes 4 assorted cheese bars and 3 assorted sausages displayed on this attractive hard wood serving tray with handles. 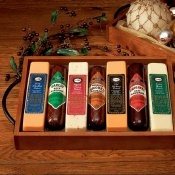 Both practical and affordable, this snack tray is perfect for parties, corporate giving, or any occasion!